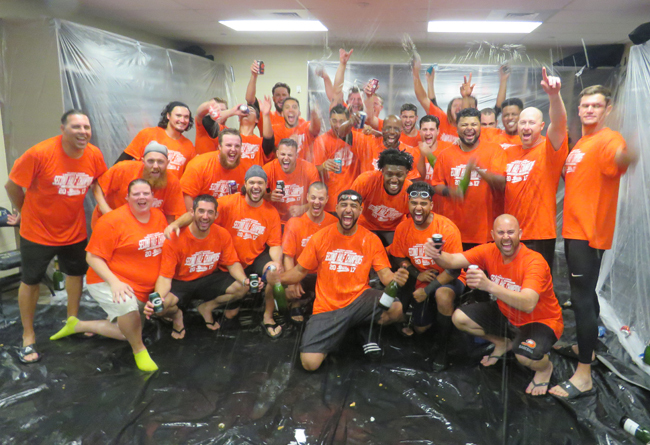 (Sugar Land, Texas, Sept. 16, 2017) – The Long Island Ducks clinched a postseason berth on Saturday night as the Second Half Liberty Division champions. Long Island’s victory on Friday night coupled with a loss by the Bridgeport Bluefish to the Somerset Patriots on Saturday secured the playoff spot. This marks the third consecutive season that the Ducks have reached the postseason and 12th playoff berth in franchise history, all coming in the past 14 seasons. It is also Long Island’s seventh second half division title in team history (2005, ’07, ’08, ’09, ’11, ’13, ’17) and 12th half-season division championship in team history. The Ducks will begin their quest for a sixth Division Championship and fourth Atlantic League title on Wednesday night when they open the Liberty Division Championship Series against the Somerset Patriots. Game One of the best-of-five series will begin at 6:35 p.m. with the Bethpage Ballpark gates opening at 5:35 (5:20 for full season ticket holders). The first 1,500 fans in attendance will receive Good Times, Every Time Notebooks, courtesy of People’s Alliance Federal Credit Union. Tickets to the game, and all Ducks postseason games, are available online now by CLICKING HERE. Fans can purchase tickets at the Bethpage Ballpark box office or by phone at (631) 940-TIXX beginning Monday, September 18 at 10:00 a.m.
Long Island wraps up the 2017 regular season on Sunday afternoon with the finale of a three-game series against the Sugar Land Skeeters. Game time is slated for 2:05 p.m. CDT from Constellation Field. Fans can follow all the action on the Long Island Ducks Broadcast Network. Live streaming HD video and audio will be available via BoxCast on the Ducks’ official Facebook page, YouTube channel and at LIDucks.com. Right-hander Tyler Levine (3-2, 6.06) toes the rubber for the Ducks against Skeeters righty Alberto Rodriguez (0-0, 2.70).